Investigating Agatha Christie's Poirot: Agatha Christie's Poirot - A 1936 Time Warp? Agatha Christie's Poirot - A 1936 Time Warp? For those of you who have read my chronology of the ITV Poirots over at www.poirotchronology.blogspot.com, it must sometimes seem as if all I care about is pointing out all the mistakes and inaccuracies of the excellent production team in setting their adaptations in specific years and on specific dates. Now, I won’t pretend that I do find some of the mistakes they’ve made inexcusable. That applies mainly to the instances of setting episodes at the exact same time, or overlooking previous character development; in short, what the person responsible for checking for continuity errors should be doing. However – and this is important – I am very keen to defend their decision to keep Poirot in its pre-war setting. I’ll try to explain why. Having spent an unmentionable number of hours re-watching and thinking about the different episodes of this series purely with chronology and setting in mind, I can safely say that, bar the aforementioned inexcusable mistakes, the 1930s setting of the episodes makes a lot of sense. If we look at a list of all Christie’s stories in chronological order (see this Wikipedia article) and publication order (see this official list), there are really only five novels and three short story collections set in the years prior to 1930, and fifteen novels set in the years after 1940. In other words, 13 of the 33 Poirot novels and two of the five short story collections are set in the 1930s. 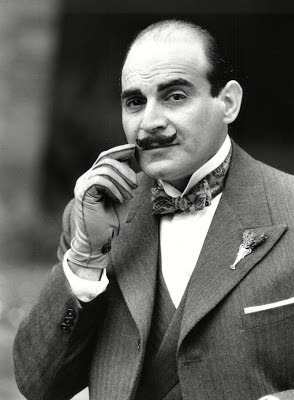 In summary, that means that no more than fifteen novels were set in the post-war years of Poirot’s (literary) career, as opposed to eighteen novels and five collections of short stories in the pre-war years. The list above may seem unnecessary and rather confusing, but I include it to support my main argument here, i.e. the producers were right to choose a pre-war setting for their adaptations. My only regret is that they didn’t start the series in the mid-to-late 1920s instead, so that the first few series of short story adaptations (1, 2, 3 and 5) would be seen in their accurate 1920s setting. Still, I can understand why they chose the 1930s in the end. Visually and historically, that decade is naturally the most exciting, a period of great changes in technology and society, including a coming war on the horizon. Also, although I’ve never seen this mentioned explicitly, I would think the producers were keen to distance themselves somewhat from the magnificent Sherlock Holmes adaptations with Jeremy Brett produced at the time (1980s and 1990s), and setting the series in a decade that was easily distinguishable from the Victorian period would obviously help in that respect. [There’s more on their decision over at poirotchronology, in the documentary Super Sleuths (2006) and in Peter Haining’s book Agatha Christie's Poirot: A Celebration of the Great Detective (1995)]. Original producer Brian Eastman once said that to him, ‘there was something about all her [Agatha Christie’s] writing which felt pre-war’ (Haining, p. 13). I think that’s a point most Poirot fans can agree on. Personally, at least, I like to read about Poirot in the era of post-war austerity and the youth culture of the swinging sixties, but there is always a sense that he doesn’t quite fit in. Of course, that’s part of Christie’s fun in the later stories, but I still think Poirot is very much a man of his time, and that time was pre-WW2. Also, there’s the issue of age. Christie admitted that it was a mistake to make Poirot a retired policeman in her first novel, particularly in light of the fact that he continued to exist for so many decades. I don’t see why a television series can’t attempt to make up for that mistake by moving him back to his milieu. Especially since Christie actually wanted to kill him off as early as the 1930s and wrote his death in the 1940s, so it’s not as if she really wanted to write books about him in the post-war era (or at least that’s what it looks like from a reader’s perspective). To begin with, I don’t think the production team were consciously thinking that they would keep all Christie’s stories in the 1930s. In fact, in Haining’s book on the series, they seem to think of the decade more as a starting point than as the final destination, explaining that they are considering how to age David Suchet for the stories set in the post-war era (p. 39). But this decision must have been reversed by the series’ return in 2000 – and certainly by the reboot in 2003. Still, it’s interesting to note that it was not until Series Ten and Eleven that they decided to tackle the most “challenging” post-war stories, e.g. Taken at the Flood and Third Girl, clearly considering their options. The setting of the post-war novels in the 1930s has largely been a success. Evil Under the Sun, Five Little Pigs, The Hollow, Mrs. McGinty’s Dead, After the Funeral and Cat Among the Pigeons, all set in the 1940s and 50s, didn’t need much adjustment (in terms of setting, that is!). Novels like Hickory Dickory Dock and The Clocks needed some adjustment, but both seemed to work (I particularly like the war preparation in the latter). Hallowe’en Party is, I’ve been told, somewhat out of place, since the concept of Halloween celebrations weren’t really known in the UK in the 1930s. The main challenges – and the least successful adaptations perhaps, in terms of setting – have been Taken at the Flood and Third Girl. The war setting of the former is integral to the storyline, and the latter lacked the drug element central to the 1960s plot. The final five adaptations, however, shouldn’t be too difficult to adapt to a late 1930s setting (Curtain, of course, about a decade later). The title of this little article ends with a question, ‘A 1936 time warp? '.That question refers to the most common criticism of the decision to set all the stories pre-war, i.e. that the series seems to be stuck in a constant 1936 setting, much like a completely different period drama, ITV's Heartbeat, which was predominantly set in 1969. (I've noticed that the current version of Wikipedia's list of Poirot episodes seems to reinforce this idea by stating that only The Mysterious Affair at Styles and Murder on the Orient Express are set outside the 1936 time frame). However, what I learned from my chronology project was that although one might tend to think that the entire series of Poirot is set in 1936, the majority of the episodes do not refer to specific dates or years at all. In fact, when it comes to the most “sensitive” stories, i.e. the ones that should really have been set in the 1920s or in the post-war era, there are only rarely explicit references to 1936. Of course, costumes and production design do reveal that it’s set in the 1930s, but there’s luckily no attempt made at forcing absolutely every episode into this and surrounding years – even if they have come close on the occasions I mentioned initially. As a result, I have tried to allow for some leeway in the setting of these episodes by widening the time frame of the series from 1928 to 1939 (plus Styles and Curtain, obviously). You can see my chronology for more details on that. Also, even if we take the episodes that are explicitly set in the 1930s into account, the myth that it’s all 1936 is wrong. In fact, the conscious time span (if there ever was one) seems to be from 1934 to 1938 (probably 1934-39 by the end of the final series), not too far away from my chronology. To conclude, I wholeheartedly support the decision to set the stories in the pre-war years, mainly because the character and the stories he is in generally seem pre-war in tone (with some notable exceptions), and because the ageing of the character – an error Christie admitted to – seems much more realistic. Also, the myth that the series is stuck in 1936 is mainly just that – a myth. My only regret is that they didn’t set the majority of the short stories in the 1920s, even if the decision seems sensible enough. Hopefully my chronology has managed to compensate for at least some of that discrepancy. Very interesting article ! I've never noticed the continuity in setting through the episodes but you're right; it doesn't always fit with the novels' publication dates. But I LOVE the settings, costumes and atmosphere, especially in series 7-12. Yes, I would agree with the whole tenor of this article. In particular, I would concur with what you say in the fourth paragraph. We must never forget that Agatha Christie (thoroughly fed up with the character she had created as she was) sought to kill him off at the end of the 1930s. It's interesting to imagine if "Curtain" had been published in 1940 and if Christie had written no more Poirot novels after that (or had just written stories projected back into the past, as the later "Early Cases" short stories were). We would see him more clearly as a man whose time was undoubtedly the 1930s. My point exactly. He never really adjusted to post-war society (and he couldn't have, even if he wanted to). He was steeped in a pre-war world, and that's why I think the producers made the right choice with Suchet's Poirot. Christie only wrote Curtain in the early 1940s because she worried that, what with working in London so much, she might very easily die. Thus, she wanted to leave a 'nest-egg' for her daughter Rosalind. This she did, proceeding to sign over the deeds to the novel to her. Of course, as it happened - very luckily - Christie did not die, and she and Poirot lived in for a few more decades. Oddly, however, Curtain ended up working very well for the 1970s, in many ways. You have so many people in that guest house having "assignations," and the debate between Poirot and Judith over whether she should get married. She sounds very post-WWII feminist. "Of course you will have a husband. What did the Lord make you for?" is one of Poirot's more cringe-worthy expressed opinions, but I suppose the fact that Christie didn't even like Poirot means we don't have to assume SHE endorsed that view? I think his views on gender relations flipped around a lot from book to book, anyway? On the whole, though, I do think it was a good decision to set most of the adaptations in the 1930s (or by slight extension, late 1920s) - in other words, during the 20 years or so BETWEEN the two World Wars. If any work is set during a World War, you kind of have to deal with it going on in the background - and come up with reasons for the younger male characters to NOT be off fighting. In the Poirot episode, "The Dream", there is a major mistake. The story as presented would be impossible. In the story, Poirot tells his audience that the victim was dead at a time which was earlier than the time that Poirot later tells his audience the victim was killed. Check it out. Please let me know if I've failed to understand something. He doesn't say the victim was dead. He only says the victim was in the next room (quoting, more or less: "what was there in the other room that Mr Benedict Farley didn't want me to see? Mr Benedict Farley himself!"). As I understand it, while the murderer received Poirot in his office, disguised as his boss, the latter was in his own office, next room, maybe working late or something, but still very much alive. Does that make sense? Episode-by-episode: How Does Your Garden Grow?